Gold is a highly prized asset, and is always in demand. Since gold has high electrical conductivity, it has many industrial uses. Gold is a tangible monetary asset and is used as an investment tool and a store of value in countries with unstable currencies. Gold is traded globally and enjoys high liquidity. Gold is commonly used in jewellery for many reasons. Gold is valuable because it is rare and does not tarnish. Gold alloys with other metals to create gold jewellery of different colours e.g. 9k, 14k, 18k, 22k jewellery. Gold is easy to work with because of its physical properties. It can be hammered into thin sheets, drawn into wire and worked into intricate designs. Gold can also be melted and cast into any shape. Its distinct yellow colour and brilliant lustre has made it a very memorable metal throughout history and mankind’s fondness of gold continues to grow today. The karat system is commonly used to represent the purity of gold. A higher karat number suggests higher purity in your gold jewellery. There may be a reason for a particular karat number being used in your gold jewellery. For example, 18k gold, which is 75% gold with 6 other parts of metal(s), allow variations in colour, for example, yellow, white & rose. Keep in mind that 10k is the minimum karat that qualifies an item as “gold” in the United States. 22 parts gold & 2 parts of one or more additional metal(s), making it 91.6% gold. 20 parts gold & 4 parts of one or more additional metal(s), making it 83.3% gold. 18 parts gold & 6 parts of one or more additional metal(s), making it 75% gold. 14 parts gold & 10 parts of one or more additional metal(s), making it 58.3% gold. 10 parts gold & 14 parts of one or more additional metal(s), making it 41.7% gold. The colour of gold depends on the type of metal alloys used. In its purest form, gold has a metallic lustre, is shiny on a clean face and has a yellowish colour. However, pure gold is never used in jewellery because pure gold is too soft. Pure gold is alloyed with other metals like silver, copper and zinc to create yellow gold. Once alloyed, gold becomes durable and is used in jewellery. White gold is very popular in contemporary jewellery. It has a wide appeal among consumers because of its silvery white appearance. To create white gold, pure gold is alloyed with small amounts of other metal like zinc, nickel or and copper. It is then plated with rhodium. Rose gold is a term used to describe gold alloyed with copper. Since copper has a reddish hue,varying proportions of copper with gold gives gold a pinkish look. Other names of gold and copper alloys are pink gold and red gold. Platinum is extremely rare. Naturally silver-white, the colour of platinum does not fade over time. Platinum does not tarnish and is durable. Because of its physical properties, platinum may exist in about 90-95% purity. Although highly prized, platinum suffers from liquidity issues unlike gold or silver, which are considered tangible monetary assess. Silver is a silvery white precious metal. It has wide uses in industry because of its high electrical and thermal conductivity. A noble metal, silver resists corrosion and tarnish to a lesser extent than gold. Silver’s antimicrobial property and non-toxicity allows it to be used in medical applications. Its attractive lustre makes it a popular choice in jewellery. Like gold, silver enjoys high liquidity and is commonly traded in global markets. Palladium is an extremely rare element that is part of the platinum group of metals. It is a known as a noble metal because of its resistance to corrosion and oxidation. Palladium is less dense than platinum. Naturally silver-white, it does not tarnish when worn. Palladium’s primary uses are in industry. The Colour of a diamond is the degree of whiteness. According to GIA’s diamond colour grading system, colour grades start with D and end at Z. Whiter diamonds typically have a greater value. Clarity refers to the degree of inclusions and blemishes of flaws, carbon, spots, crystals, scratches, feathers, etc. in a diamond. The clarity of diamonds is graded using a 10x loupe. In short, higher clarity grades represent the increasing difficulty to spots inclusions and blemishes using a 10x magnification glass. Internally Flawless. Without internal flaws or inclusions. Very Very Small Inclusions 1 & 2. It is difficult to see with an untrained eye using a 10x magnifying glass. Very Slight Inclusions 1 & 2. Difficult to see using a 10x magnifying glass. Slight Inclusions 1 & 2. Inclusions more easily detected under 10x magnification. Inclusions 1, 2 & 3 are visible under 10x magnification and even to the naked eye. Number of facets, polish, culet size and other characteristics affect the brilliance, fire and scintillation of a diamond. Brilliance refers to the reflection of all white light from the surface and inside of a diamond. It refers to the brightness of a diamond in a lighted environment. The number of facets affects the proportion of the diamond, which has an impact on its brightness. 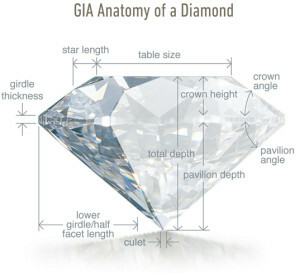 A diamond’s polish is the degree of smoothness of each facet. Polish affects the reflection of light upon each facet. If the culet is too large, light escapes from the diamond, making it less brilliant. A diamond’s fire can be better observed in a darker environment. The flashes of colour observed are known as fire. Sparkles in the diamond are known as scintillation. Cut proportion affects the refraction and dispersion of a diamond’s fire and scintillation. Cut is graded by GIA on a scale of poor to excellent. Carat weight is the unit of measurement for a diamond. Buying and selling diamonds depends very much on the integrity of the jeweller. JUMBO GOLD & DIAMONDS specialises in buying and selling diamonds from 0.5 cts and up. We buy and sell diamonds at reasonable prices. Our business is about turning satisfied customers into repeat customers. Have a diamond to sell?